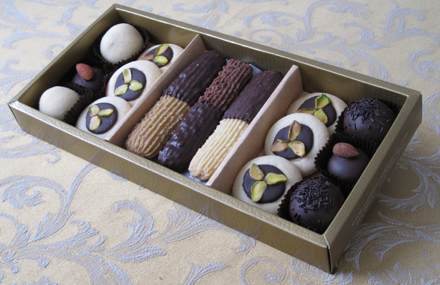 Assortment box of Russian Cookies and Austrian chocolate-dipped Vienna Fingers in vanilla, chocolate or coffee flavors for a truly “classic” experience! *We use isomalt as sugar substitute. Isomalt is a natural product derived from the sugar beet, completely safe for diabetics and those watching their sugar intake, low on the glycemic index and hardly affects the blood sugar levels. All chocolate used in coating the cookies is sugar free as well.